alaTest has collected and analyzed 148 reviews of Nespresso Inissia Coffee Machine with Aeroccino by Magimix. The average rating for this product is 4.7/5, compared to an average rating of 4.4/5 for other products in the same category for all reviews. People really like the size and performance. The maintenance and price also get good feedback, whereas there are some mixed reviews about the reliability. We analyzed user and expert ratings, product age and more factors. Compared to other products in the same category the Nespresso Inissia Coffee Machine with Aeroccino by Magimix is awarded an overall alaScore™ of 88/100 = Very good quality. This is a really well designed product. It makes smooth espressos every time. The milk frother is great - so easy to clean and good consistency of milk every time. Would recommend! Lovely tasting coffee. Great little machine. Reliable coffee machine. Please with the purchase and makes excellent coffee. 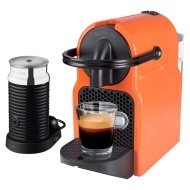 Also Nespresso compatible coffee pods are readily available from a number of outlets. Aeroccino is great for frothing the milk. I've limited counter space so this is the perfect way to get my caffeine fix. Coffee excellent / frother great / easy to use and clean. Great deal through John Lewis though a bit of a hassle claiming £75 credit - very helpful staff though. Highly recommend though wish I'd bought black version - cream is like pale yellow.